I am sorda reposting a post I did back in August of last year I think it was. A fellow blogger was asking about how well vincas do in the heat around here and well I love me some vincas and had planted them in our beds at our Baton Rouge home. 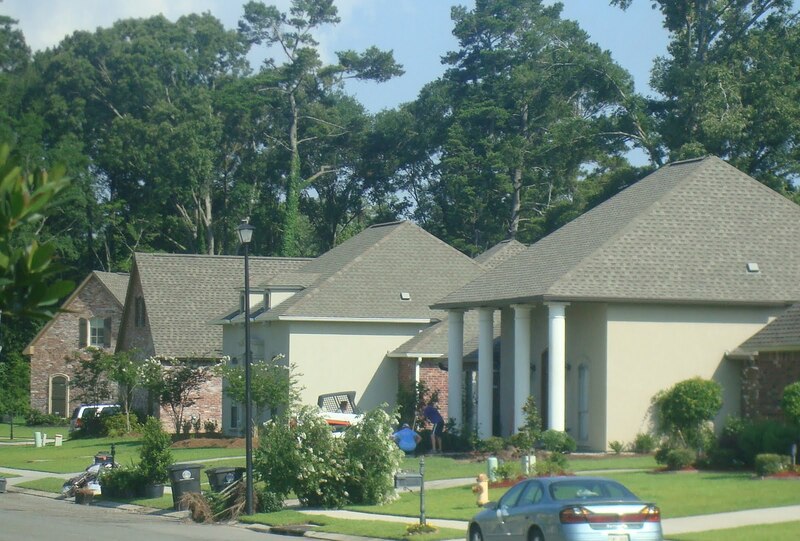 I LOVED our Baton Rouge home and one of the reasons was because we did all the landscaping ourselves which was a huge feet especially seeing as we had never done anything like that before. Here is our home when we purchased it. A complete and total blank slate. We had no idea what we were going to do with it. After some long and hard sweat equity our yard turned into this. 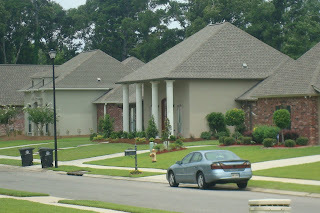 We truly were very proud of our yard and thought it had wonderful curb appeal which was important of course when selling your home which we knew we would be doing. We planted the crape myrtles because in our first home we had planted some and a carolina jasmine so it was a tradition we wanted to carry on. Something we figured would live on even though we were not there. This is what was going on at our old house today. Our neighbor heard some work going on and stepped out her door to see this. She could not believe they had pulled out the beautiful crape myrtles. Here is the finished product. It brought tears to my eyes to see the transformation and my heart is still breaking some. I know it is not our home any more and I should feel gladness that the new owners are taking pride in making it their home but it is hard. They took most everything out even the landscaping rock we put around the beds! At least they left the carolina jasmine! Geez, the start of yet another week. I really can not complain though. Today has not been bad for a Monday. Yesterday was more like a Monday to me. I went grocery shopping at Target and got home to realize I left the kitty litter on the bottom of the cart. Littliest and I went all the way back up there to get it. Thankfully they had it and that it had not walked off with somebody else. Been busy working on Many projects. I can not wait to share my before and after pics once I have everything done. Last week I painted the kitchen. Thankfully Littliest was quite content just hanging out and watching which allowed me to accomplish it all in a day. I was expecting two or three days. This weekend I hope to tackle the living room and the first half of the foyer. We are going to have to pay somebody to paint the second half. Once I am all done I will post picks! It is feeling so much more like home now. This weekend I was chatting with Melissa over at 320 Sycamore. She was sharing her updated front yard where she had planted some vincas and was hoping they would survive the Tx heat. I LOVE vincas. Why do I love vincas?? They are the only flower I can not kill. Well I could but it is hard to do. I planted them all in the flower beds in Baton Rouge. They lived pretty much year round. All I ever had to do was trim them back and they would grow fuller and then I trimmed them again once winter came about. I actually had ones around the water fountain and trellis that actually stayed green all winter if ya can believe that! I was looking forward to planting some in our new front yard but sadly I missed the window. Nobody has them anymore. I told Melissa I would post pics of my vincas. All I ever did was spray miracle grow on um every two weeks. Very easy to care for. This was during the Cajun Blizzard of 08. Ha! If you look around at the fountain you can still see how green they are and some were even still blooming. Over by the trellis the vincas were so tall that the snow weighted them down to the ground. This is Spring 09. Most of the vincas survived the snow. I only had to replant a few around the fountain. The ones by the trellis were perfect! These are my only vincas that I have now. I brought these hanging baskets with me when we moved. They are not as hearty right now since I have neglected them but last week I showered them with some miracle grow so I am hoping they perk back up. This is at the old house. I was trying to get them to fill in with out buying new ones. When I saw a new one pop up where it was not suppose to be I would dig it up and transplant it to this area. I was very surprised that it was working. The water fountain I wish I would have brought with us. I hated unclogging it but thought what a perfect planter it would have made here at the new house. These are the vincas that greeted you on the way up to the front door. They also made it thru the winter. Oh how I miss my old front porch. So thanx for joining me on my tour of vincas! I will be back later with a post abt chandys! They are gorgeous! What a beautiful home and landscaping you have there~I'm a believer in vincas now! Thanx Melissa! We miss our old home dearly but are enjoying making our new house a home. We did all the landscaping ourselves there like you and your home. I can't wait till the spring when I can get my hands on some vinca for the new place and make it all ours and not builder grade. Pam your old house and landscaping was beautiful. It must have been hard leaving that behind. Y'all did a great job.